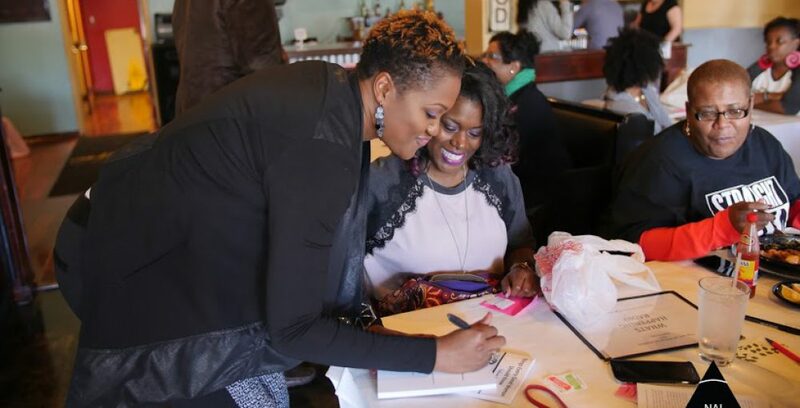 Earlier this year, I started doing something called Good Woman Gatherings. I became bored with traditional book signings and decided to make them more fun! It’s an afternoon or evening of fun and games centered around my latest book Husband Wanted. We have food, great games, some wine and lots of laughs. I’ve done three of them now in Little Rock, Arkansas; Memphis, TN; and Nashville, TN. I’m proud to say that each one had been a hit. I’ve gotten great feedback and the ladies seem to have a good time. If you would like to bring a Good Woman Gathering to your book store, organization or home please contact me. I’d be happy to come. You can reach me at imagoodwoman2@yahoo.com or 901.286.JAE1. I truly have enjoyed fellowshipping with great women and sharing my efforts with them. Here are a few pictures from previous ones. I’d like to saying thank you to the Ladies of Zeta Phi Beta Sorority Inc. for always showing up and showing out! There were fun times in Little Rock! Kiss the Bachelor. Where wouuld you put your kiss while blindfolded? We had a small but very engaged group in Nashville. I had a great times with my ladies in Memphis. Chef Chris made strawberry fajitas on the spot yum! The dessert bar in Memphis received rave reviews! I’m Heading to Little Rock, AR! To learn more about a special VIP Good Woman Gathering Friday, March 4th, click here. To read an excerpt from the book, click here.